"These savory, gluten-free muffins are easy to make, and a great breakfast to eat on-the-go. I use as much organic and/or local ingredients as possible in all my recipes. I cook these ahead of time, wrap them separately in waxed paper, then freeze them to heat later for quick, high-protein breakfasts." Cook chicken broth and quinoa together in a rice cooker or bring to a boil in a saucepan. Reduce heat to medium-low, cover, and simmer until quinoa is tender and water is absorbed, 15 to 20 minutes. 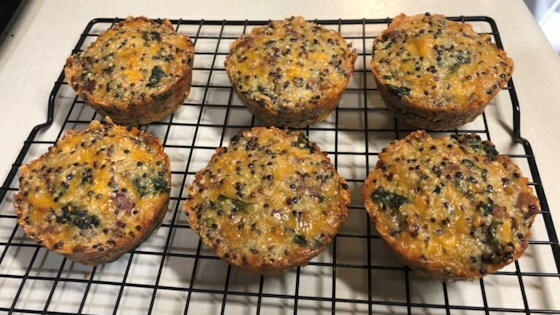 Mix quinoa, spinach, Colby-Jack cheese, eggs, bacon bits, onion powder, garlic, Worcestershire sauce, salt, and white pepper together in a bowl; spoon into the prepared muffin cups. I added an extra egg.